"Hi from the Oregon coastal village of Florence. 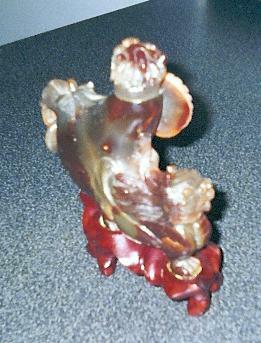 I have gone to lapidary stores, jewelry stores and they all say this is not jade, too heavy, too hard. I have exhausted my village experts. It changes color in the lighting from dark green to gray to light green to honey with ruby red flashes when you walk around it. The only signature is the yin yang on the lions shield. It is 6x8 inches 2 lbs. of carved rock into a bottle. Any clues? Love Sarah"
It has been suggested to Sarah that it is connected to the art of feng shui. Other correspondents have claimed that it is demonized and needed immediate exorcism. 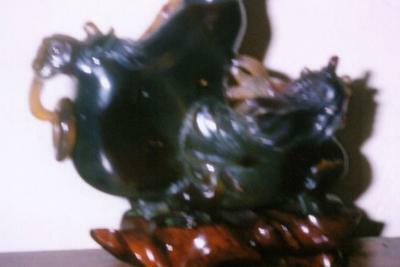 One response said it was the eye of Rah, not Chinese but from Egypt. Then there are those who think some wizard put a genie in the bottle. An other said it is the rock Jesus cast the demon into. 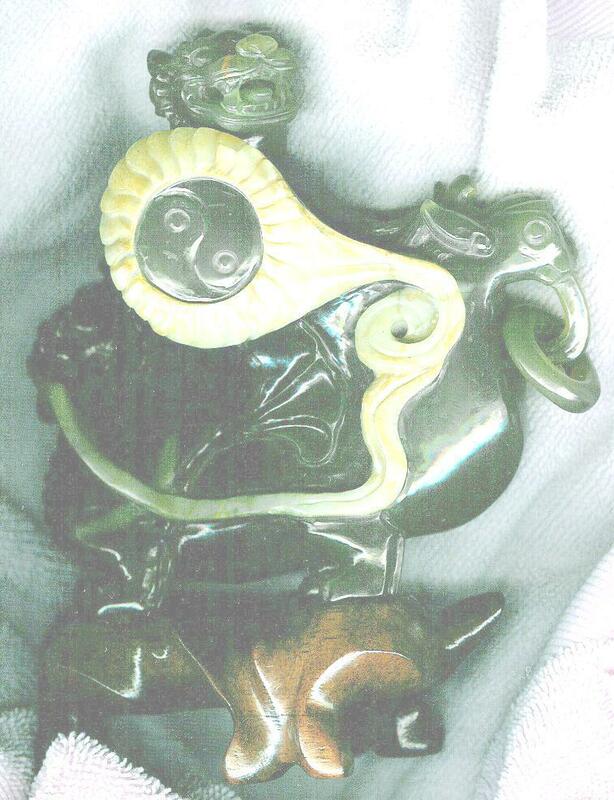 Do you have any information about this artifact? If so then please email me. 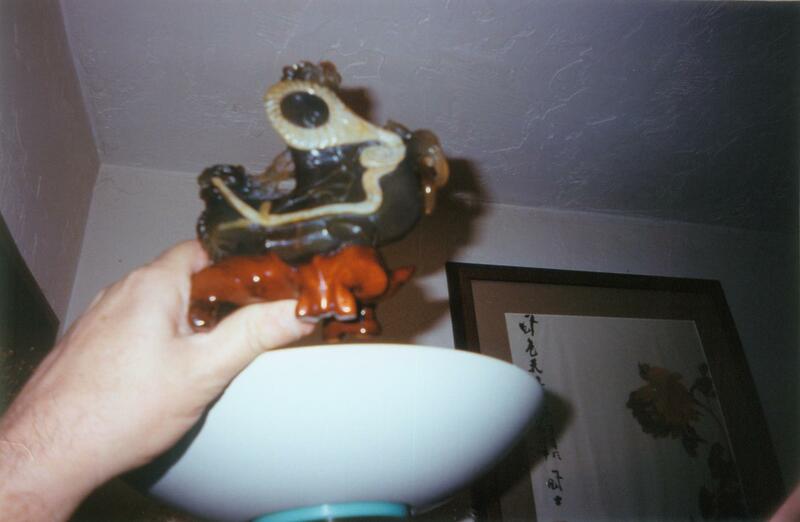 What you appear to have is an authentic or very good reproduction of a Daoist Shaman�s potion bottle. The bottle was used for various rituals, including births, deaths, ordination of priests, ceremonies to frighten away evil spirits and for use for herbs/medicine to cure disease/illness. Very often though the bottle would be empty-symbolically filled with protection �gas� to fight evil. Daoist �magic� called internal alchemy, as opposed to external alchemy- feng shui-- was used to chase away evil and protect goodness. 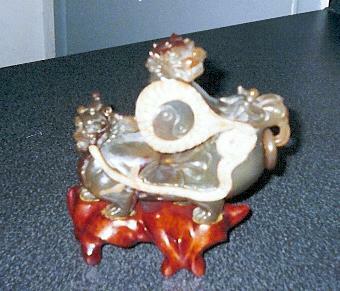 The yin yang energies- symbolised in the shield, were also symbolised by the minerals- cinnabar and mercury. 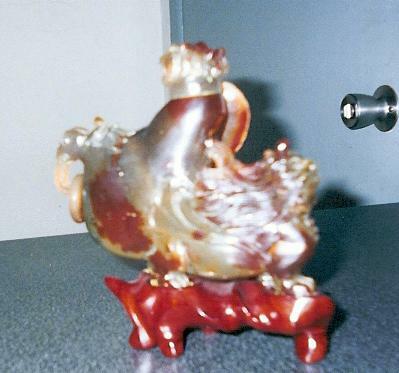 Often when these minerals were found, a bottle was shaped from the rock, containing the minerals, or the minerals were put into a mixture of glass and jade. Cinnabar is red mecuric sulphide, quicksilver was mercury, but very often some use of lead in with the mercury as well. Hollowed into a container/bottle- the humidity, air temperature, sunlight, fire, candlelight- hand warmth- all produced different combinations of colours-- like the ones you describe. The Daoist shaman would use different colour combinations for different purification and cleansing rituals. 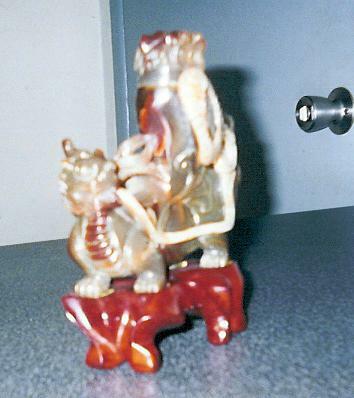 The lion, fu dog, and sometimes qirin-[Chinese unicorn]- were all used as ornaments to signify protection and the transformation of nasty energy into good stuff!!! To read more- get Understanding Reality by Chang Po-tuan--University of Hawaii press- ISBN-0-8248-1139-9--read it all, but especially around page 85. The language and style is quite difficult to understand! The bottle, and the lion�s eyes- should be placed in the north-east or the north-west of a room/building- and should not face the front door- toilet or kitchen! Paul Darby-The Feng Shui Doctor.